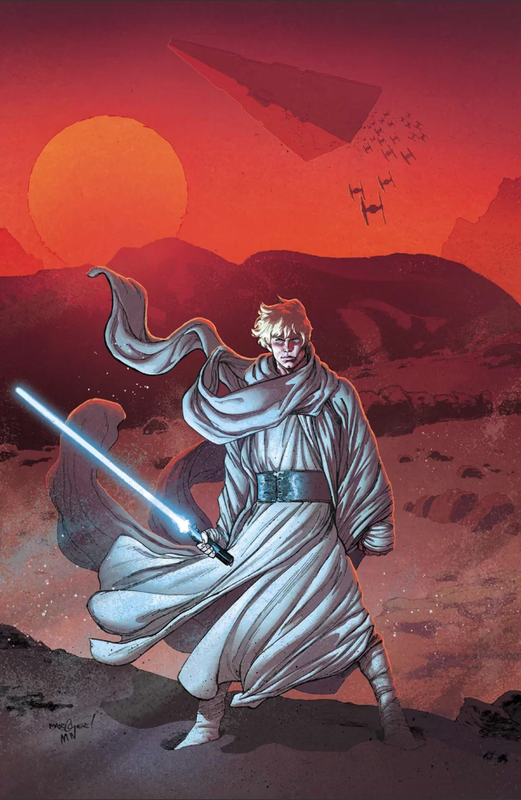 Star Wars #38 is interesting on several levels. It delves back into the world of Jedha and Saw Gerrera’s partisans as Luke, Han and Leia go looking for allies. It marks the return of one of Saw’s partisans from the movie Rogue One, and it shows the after effects of the Death Star’s attack on the planet. We get a glimpse of the Imperials now in charge of scavenging what’s left of the world’s kyber crystals, and we see the return of a character from the Darth Vader comic series. This issue also marks the changeover in writers from Jason Aaron to Kieron Gillen. The issue opens on Jedha in the middle of a sandstorm. Several of Saw’s partisans are pinned down by Imperials and preparing to blow themselves up rather than be captured. However, Luke and Leia save the day. Right off the bat, things are pretty interesting. One of the partisans is a priest from Jedha, the ones who look like squared versions of the Emperor’s royal guards. Gillen give’s the character a religious bent in their dialog that’s reminiscent to Chirrut. As they leave the battle, they head to NaJedha, which isn’t exactly explained in the comic, but Jedha is actually the moon of the planet NaJedha. From there, Luke and the priest are able to gaze upon the half dead moon of Jedha and remark on the will of the Force. It’s a nice conversation that helps flesh out the priest character, whose name is Chulco Gi. He’s an aspirant to the Disciples of the Whills. The other primary partison the issue develops is Ubin Des. Eventually the partisan storyline leads Luke, Han and Leia to the remnants of Saw’s surviving partisans and a familiar face. Aside from the Partisan storyline, this issue explores the Imperials who will be playing the bad guys in this arc. One of them is a new character called Commander Kanchar, an old and grizzled one-eyed commander with a robotic arm but also very muscular and short tempered. He’s accompanied by Queen Trios who we saw in the Darth Vader comics on the mining world of Shu-Torun. Her presence at Jedha actually makes a lot of sense as they’ll be mining the world for the resources and in it’s current state, it’s a hellish landscape, much like her own homeworld. The comic is obviously setting up a collision course between her and the partisans. The question is – will the good guys win as usual? Hopefully Gillen has some surprises up his sleeve. As for the artwork, Salvador is continuing to polish his style which mixes different textures and degrees of realism when it comes to character’s faces and everything else. There’s a marked difference between the look of the human character’s faces, which is very photo realistic, and that of the rest of the comic which looks like your typical comic book artwork. On one hand it makes their faces jump out a bit more than they should, but on the other hand, it does make the characters look more like their real world counter parts. Jarring textures aside, there’s lots of detail, good coloring and lighting, and the action is easy to follow. There’s some nice panel layouts, especially with the shot of Jedha in the NaJedha sky. It’s not perfect, but the artwork works, and overall, it’s pretty good. Kicking off a new chapter in the ongoing Star Wars series, issue #38 does a good job of moving things forward in a new, fun direction. The ties to Rogue One maintain just the right amount of fan service. It sparks interest, retains some familiarity, and further explores where the film’s story left off. It’s a nice start to a new journey and I give it a four out of five metal bikinis.